Many of us don’t use our RVs as often during the winter months as we do the rest of the year. It makes this a good time to go through the RV and organize it for the upcoming camping season. The first thing to do is sort through everything that has accumulated in your RV and ask yourself, “Am I likely to need this on the next trip, next year, or ever again?” and act accordingly. 1. Purchase some plastic underbed storage containers with wheels. These work great in long deep storage compartments that extend the entire width of the RV. They easily roll in and out allowing access to your items, plus many compartment doors are tall enough to accommodate one on top of another maximizing the use of the space. If stacking two deep, make sure you buy the ones with indents designed to nestle the wheels of the unit above. This will keep them locked together during travel. 2. Wall space is always underutilized in RVs. Take advantage of it by installing coat hooks near the entry door. Now coats that would normally take up closet space are out and available for use, allowing you to place other items in the closet. Be sure to purchase one with multiple hooks on one crossbar (as shown) rather than individual hooks. 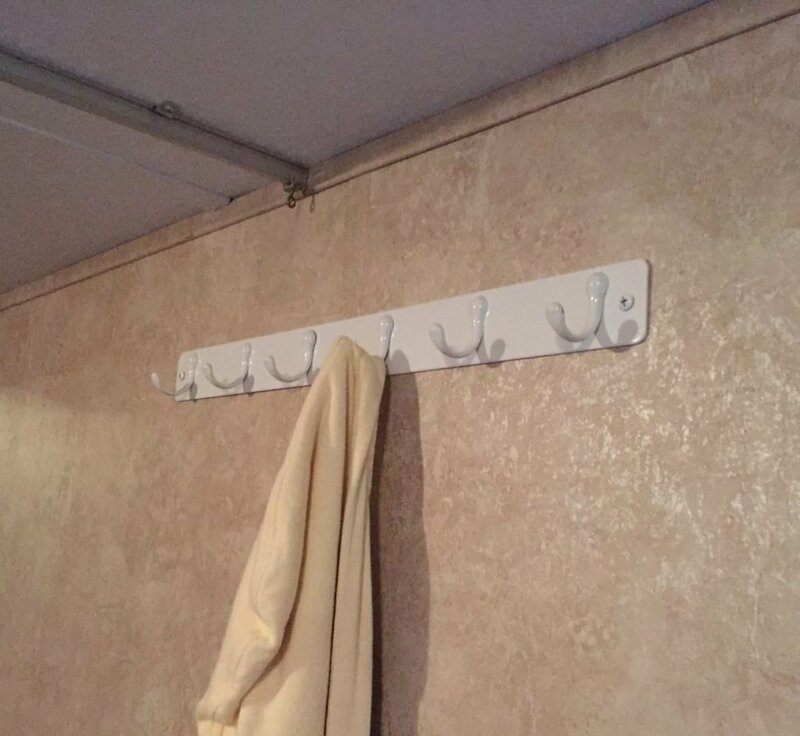 It is much easier to find one or two studs to attach a bar to rather than individual hooks that might not have any backing. 3. Use a drawer organizer. Just like a home, an RV has to have silverware for the entire family along with all the kitchen cooking utensils. The only problem is RVs have a lot less drawer space to house them. 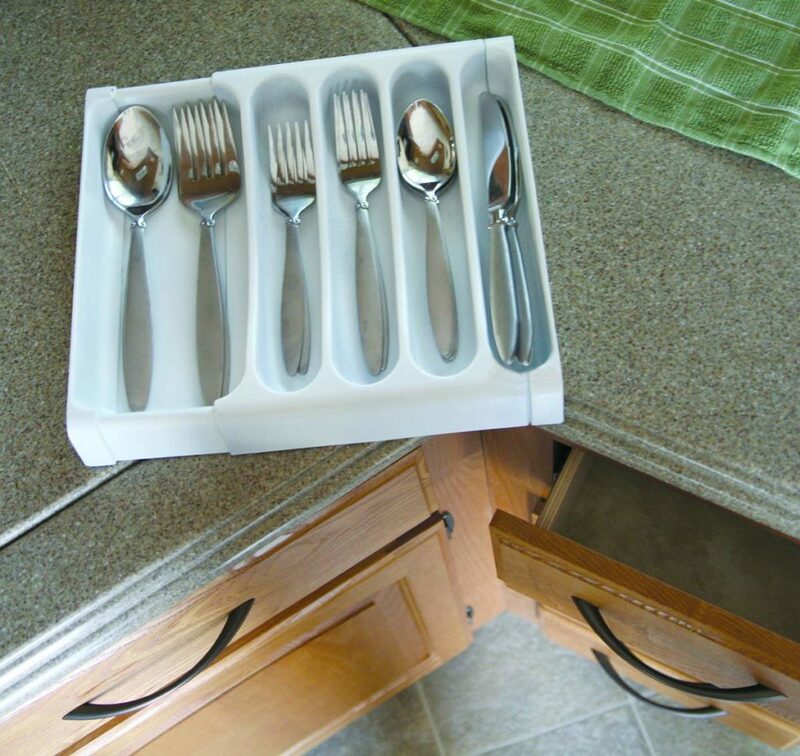 If you haven’t already, consider installing drawer organizers to keep silverware separated by type and in its place as you travel. Camco makes a handy, adjustable organizer specifically sized to fit RV drawers. 4. Double your cabinet space with wire shelving. Cabinetry is one of the most expensive parts of an RV, therefore manufacturers tend to underutilize interior cabinet space to its full potential. Many overhead cabinets feature 14” to 16” of interior height. While this is nice to store a box of cereal or two in an upright position, how many other items does an RVer take with them that need that kind of height? Head down to your local home improvement store and pick up some of that white wire shelving. It is the ideal depth for overhead cabinets and if you install the vertical edge that is normally turned down in household applications, turned up instead, it acts as a lip keeping items from sliding off the shelf during transit. 5. Use curtain rods to keep items from moving. 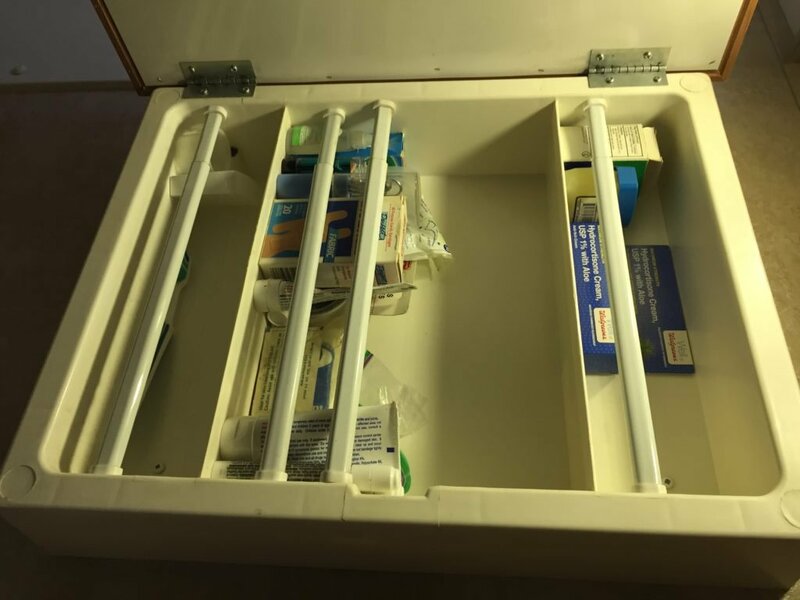 The thought process used while designing most RV medicine cabinets is questionable at best. 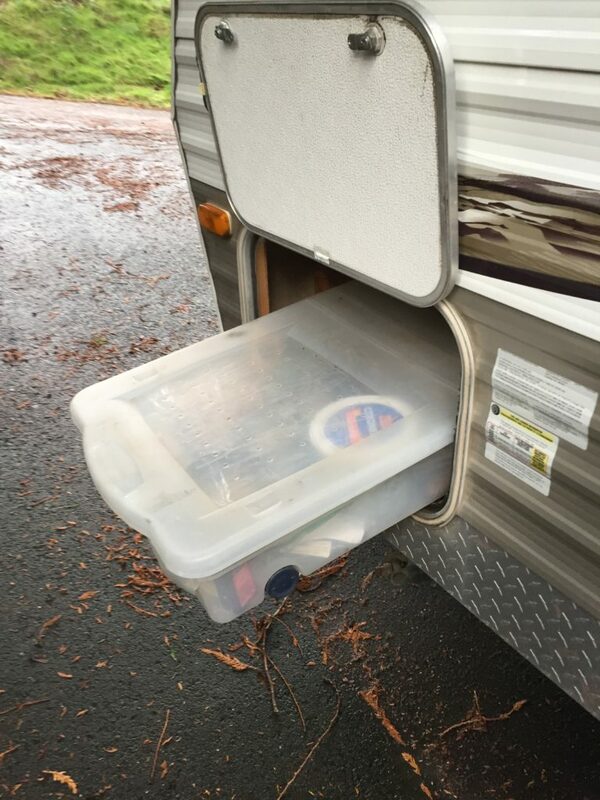 Shelves that are a just few inches deep are made of plastic or another slick material that are supposed to keep items in place while an RV bounces down the road. 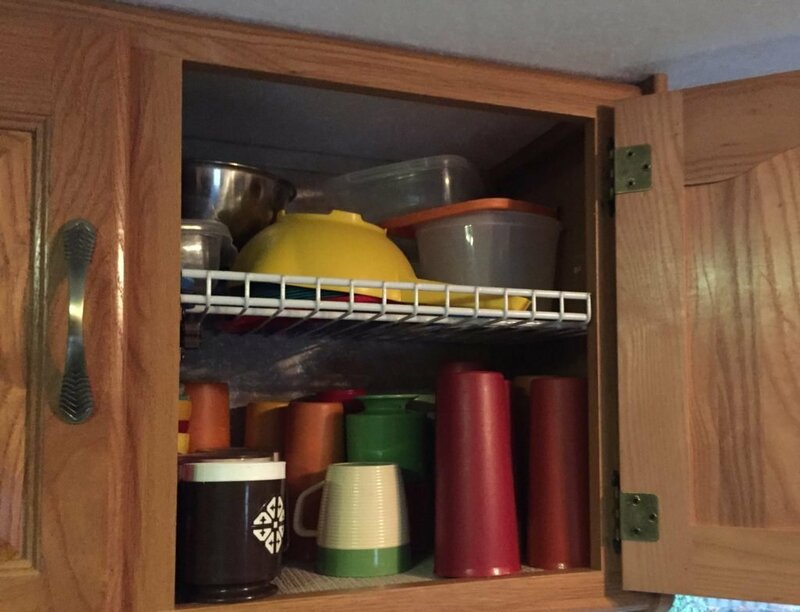 As most RVers quickly learn, the only thing keeping the items on the shelf is the cabinet door. Once opened the items quickly exit the cabinet. After you have taken the time to clean out the items you don’t need next season, you can keep the balance of the items organized and upright by installing some spring loaded curtain rods. They are inexpensive, easy to install, and you can adjust them to the height and depth needed to keep your items in place. Now when spring arrives, you and your RV will be prepared for your next adventure in RVing! I used spring rods in frig as well as in the bathroom to keep large items flush to wall behind my toilet. My upper cabinet is set in the corner and I use 2 inch wide strips of plexiglass cut to length to hold items in cabinet. It keeps them from tipping over and out when I open door. In my experience, see-through storage containers tend to be fragile in cold weather and will crack if dropped or bumped hard enough. Solid colors usually are more rugged and less susceptible to breakage.